Free-to-play games are as popular as ever these days, and they are slowly making their home on the Nintendo Switch. With the release of Super Smash Brothers Ultimate approaching, it seems like such a coincidence for the system to receive such a similar fighting game in Brawlhalla. At its core, Ubisoft has created a 2D fighter where the goal is to knock your opponents out of bounds. While the resemblance is there, perhaps there’s more to this fighter that would justify spending a few extra dollars – or, maybe not? While Brawlhalla can be easily compared to that of another certain smashing fighter, its gameplay gives it a bit of a unique edge. You’ll start a match by choosing a character from the wide selection of fighters, or from eight starter fighters if you refuse to purchase the full roster. Each has two different weapons that they can take into battle. You’ll start the match with your base character, but eventually swords will start falling from the sky for you to pick up and randomly equip one of your character’s weapons. Both weapons change your character’s move sets drastically, giving them new attacks and special abilities. This gameplay mechanic is executed very well and adds some randomness and fun into each match. A major problem with the core concept of the game is that the moves for the various characters are very basic. You have your normal punches and kicks, as well as some special attacks like an uppercut. Now imagine that, but with weapons and that’s the extent of the fighting. Sure, the addition of unique weapons adds a little flair to the fighting, but there aren’t any vast differences on a fighter-to-fighter basis. In Super Smash Brothers every character has a vastly different move set, with each fighter feeling very different to play as. 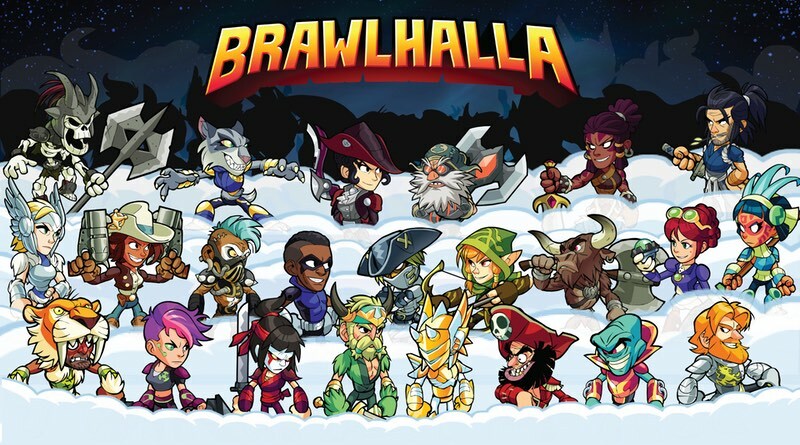 In Brawlhalla every fighter looks different, but they all feel identical. Instead of the weapon system, I would have preferred they just make the weapons a part of the fighters’ base moves. As it is, there’s very little incentive to play as one fighter over the other and it almost feels like you’re just changing skins. The characters feel very bland as well. One of the most vital aspects for a free-to-play game like this is giving the players characters they’ll care about. Games like League of Legends or Arena of Valor put hard work into their characters’ personalities and stories. They make each one feel unique and they give players a reason to want to invest time or money into unlocking them. When it comes to Brawlhalla there is no character that stood out to me. None of the locked characters looked interesting enough for me to want to invest money or time to unlock them except for Shovel Knight and Rayman thanks to their established star power. The original characters all feel very basic. Perhaps Ubisoft should have coordinated with more companies to include more famous fighters to round out the roster. The game’s main focus lies with its online modes of play. There’s a variety of modes to choose from, like casual/ranked matches, fights where you can test out new features, some event modes like a Rayman-themed football session, and so on. While the variety of game modes is nice, I didn’t have the best experience playing online. It’s no secret that the Nintendo Switch doesn’t have the best online functionality, unless we’re talking about first-party games. Many of the matches I played consisted of my character lagging all across the field and flying off in different directions without me being able to see what even happened. Maybe it was just my internet connection, but I wasn’t too pleased with the online modes. That being said, one thing I will give the game praise for is that it actually has a decent amount of offline modes. There’s a training mode, a local co-op mode, and a tournament mode where you can play against A.I competitors. I wasn’t expecting any offline modes at all when I walked into this game, and I was pleasantly surprised at what they offered. As you can imagine I spent most of my time playing the game offline, and despite all of my previous criticisms I had a lot of fun. The A.I was surprisingly hard, making the tournament mode a real challenge to get through. It’s sad that they put so much effort into the A.I that’s only used for very few offline modes. It would be great to see the game update with even more offline options to utilize the A.I even more. There are some other issues with the game, such as generic stage designs, forgettable music, and the fact that almost everything is locked behind a paywall. It’s understandable for a free-to-play game to try and earn money through in-game purchases like this. However, the problem is that nothing being offered feels like it’s worth the price being asked. If you pay to play the game, then you will most likely feel ripped off at the content being offered. If you play the game for free, then you hardly have any content to mess around with. No matter what side you choose to play on, you’ll just feel unsatisfied. It’s this weird situation where you can’t really argue about what’s being offered because it’s a free game, but you also can’t justify the content they want you to purchase. Brawlhalla is a decent attempt at a free-to-play fighting game, though it leaves much to be desired. There’s some fun to be had with the offline modes, but nothing stands out enough that would make you want to spend actual money on the game. If you need something to hold you over till Super Smash Brothers Ultimate releases, then go ahead and give this game a shot.